For Leanne Cole’s Monochrome Madness this week a venture into my equestrian life. It is a real privilege to work regularly with and benefit from the knowledge and years of experience the Master equestrian brings to our training sessions. He is so invested in the welfare and development of horse and rider that I can truly say it is the first time in my life I have glimpsed my potential as a rider, and we’re still only seeing the tip of the ice berg. And not just my potential … a good trainer knows how to bring out the best in both rider and horse and I will say that in the eight years I’ve had my horse Shakespeare (aka Bear) I’ve never seen him go so well. He is really beginning to shine. Of course, the development is gradual and the Master takes into consideration all the “i”s to be dotted and the “t”s to be crossed. He is in no rush. One of the things I respect about him is how he respects the process. This allows me to take everything in stride without feeling the pressure of lost years and past regrets. I believe a true Master helps his/her students see their potential and gently guides them, through example and technical instruction, in the direction of their dreams. One of the things I appreciate about this coach is his desire and ability to share what he has learned in an open and honest way. No guessing games. No mind reading. His explanations and expectations are clear (tinged with a German accent … ) ~ he wants only what’s best for horse and rider and, through his teaching, does his best to ensure this is so. I feel so fortunate ~ at this stage of my life and with almost 40 years with horses under my belt ~ to finally have the opportunity to work with a Master equestrian. 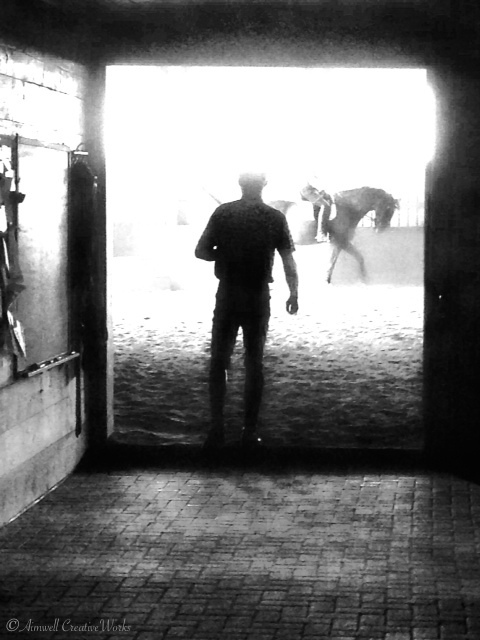 This entry was posted in Animals, Art, Equestrian, Photography, Uncategorized and tagged Aimwell CreativeWorks, Daily Prompt, Dorothy Chiotti, Equestrian, Equine image, horse and rider, Horses, iphoneography, Leanne Cole, Light and shadow, Master equestrian, monochrome, Photography. Bookmark the permalink. What an honour this must be, I grew up cattle driving on horse back but haven’t been in the saddle for a good 10 years. This post makes me want to head back out west! Very well put – Ty for articulating so much of how I feel regarding SvS! Word press removed my follow of you? This is the third time in a week. So nice to be back on track Dorothy! I do love the term Master Equestrian !